Not strictly an Alice book, but features Alice characters used as weapons in an epic battle between librarians and dinner ladies! Jarrett J. Krosoczka has his own website if you want to find out more. 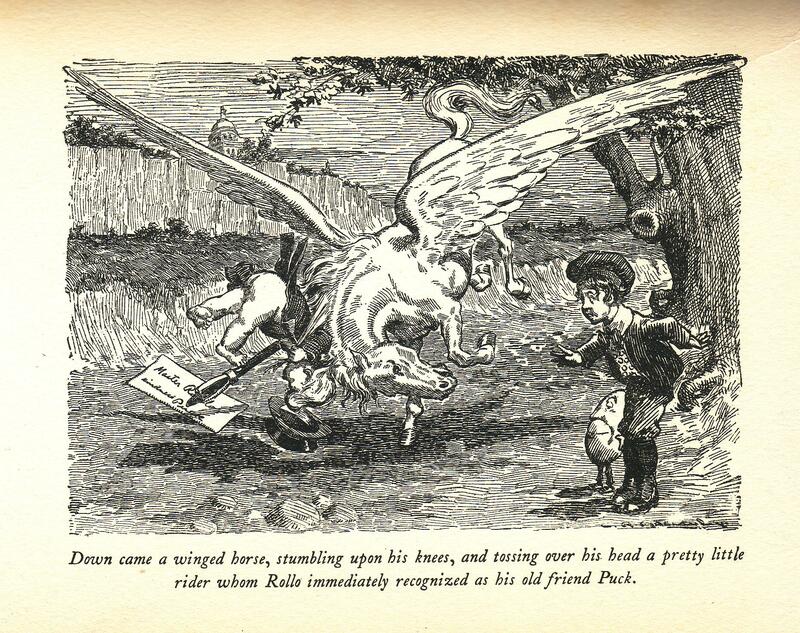 Emblemland: John Kendrick Bangs, illustrated by Charles Raymond Macauley. Also known as Rollo in Emblemland. Published in 1902 by R.H. Russell, New York. First edition hardback, no dustjacket. 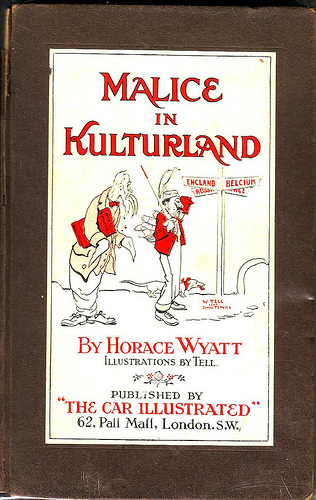 Inspired by Alice’s Adventures in Wonderland: a boy named Rollo falls asleep and finds himself in “Emblemland”, a strange country peopled with symbols and icons such as John Bull, Uncle Sam, the Owl, the Stork, Puck, Mr Punch, Father Time and Cupid. John Kendrick Bangs (1862-1922) was born in New York, and was an author, editor and satirist. Charles Raymond McCauley (1871 – 1934) was a newspaper cartoonist, published in the New York Daily Mirror. Alice and the White Rabbit – Their Trips Round About London by Brenda Girvin. Published by Partridge & Co, London, undated – ?1900? That’d be the first edition: not sure if this is that or a subsequent print. I think it’s probably not a first, as I’ve seen that described as having a blue cover. Hardback, no dustjacket. Frontispiece and 7 full-page black and white illustrations, and 25 illustrations in the text, all by Evelyn Stuart Hardy. The cover is rather splendid too. Hardy came from a family of artists (father, mother and two brothers) living in Bristol. Although known as Evelyn Stuart Hardy and commonly said to have been born in 1870, she was apparently actually born Beatrice Evelyn Elizabeth Hardy in 1865, but became younger with each census! 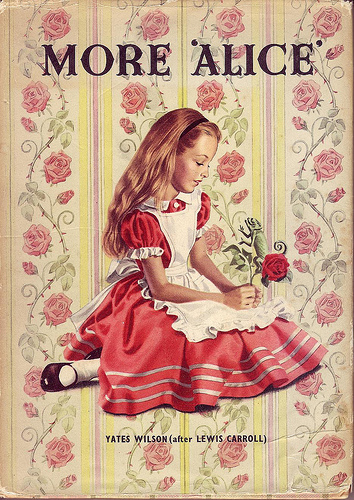 In the book, Alice and the Rabbit come to London and visit the Tower, the Zoo, Madame Tussaud’s, the Bank of England and others. 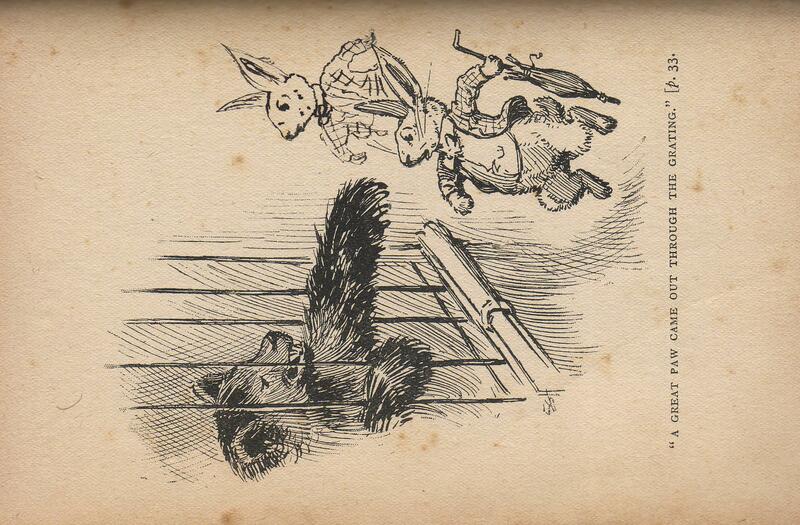 Sometimes available on Amazon: Alice and the White Rabbit . 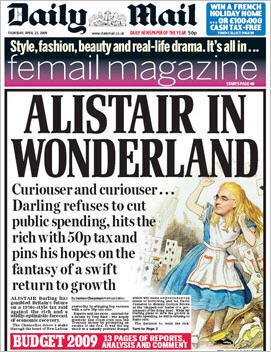 ALISTAIR IN WONDERLAND; Curiouser and Curiouser … Darling Refuses to Cut Public Spending, Hits the Rich with 50p Tax and Pins His Hopes on the Fantasy of a Swift Return to Growth. Daily Mail. Front page headline from Thursday , April 23rd 2009. Article by James Chapman, Political Editor. Alistair Darling has gambled Britain’s future on a 1970s-style tax raid against the rich and a wildly-optimistic forecast of economic recovery. The Chancellor drove a stake through the heart of New Labour yesterday by stinging top earners with a new 50p tax rate. Experts said the move – resisted for a decade by Tony Blair – was largely symbolic and could even lose the Treasury money by prompting an exodus of the rich. It was the big shock in a nakedly political Budget which will mean unprecedented levels of borrowing and led David Cameron to dismiss Gordon Brown as the ‘clapped-out’ leader of a ‘government of the living dead’. While Mr Darling plans to slow the growth in public spending, he still is refusing to make cuts. The decision to ‘soak the rich’ shattered Labour’s election manifesto pledge not to raise income tax and appeared chiefly designed to wrongfoot the Conservatives.